noun – a worker in a skilled trade, especially one that involves making things by hand. To truly know Roxanne Vinciguerra, is to taste her cooking. The consistent ingredient Roxanne uses lavishly in everything she makes is her love of people and her thrill to delight them by carefully preparing fabulous food. Her recipe for biscotti was perfected years ago when she wanted to surprise her grandmother by baking a biscotti she would love. 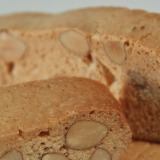 Roxanne continues to bake her perfect biscotti fresh every week in her kitchen in Morgan Hill. All ingredients are sourced locally and her dedication to quality and craft is unmatched. Roxanne is indeed a local artisan. But more than being a skilled baker her greater craft is loving people through food. Enjoy! Roxanne's Biscotti added 2 new photos. Stop by for a nibble and say hello.